This is an edited, expanded, updated, revised and (hopefully) improved version of an old post. You can see the original here (or click on the “From The Archives” icon as usual). Pilobolus has a portion of its life-cycle in which it has to pass through the digestive tract of a large herbivorous mammal. Since large mammals roam far and wide, this is a great way for the fungus to disperse. There is one problem, though: once excreted out with the feces, how do fungal spores get back into a large mammal again? Unlike rabbits and some rodents, large mammals do not tend to eat their own manure. Actually, if you observe a field with a properly kept cow herd – a relatively small number of animals in a relatively large area, and rotated regularly between fields – you will notice that all the cows poop in one spot and no cow ever comes close to that spot to graze. So, what is a poor Pilobolus to do? It gets ready, it aims, and it shoots! Pilobolus assumes the position, builds a weapon, fills it with ammunition, aims and shoots. The position is on top of the pile of manure. The ammunition are spores, packaged tightly at the very tip of the filament. The weapon is the sporangiophore, a large swelled organ right below the tip. The sporangiophore fills up with sap – osmotically active compounds – which builds up pressure until it is about 7 kilograms per square centimeter (100 pounds per square inch). 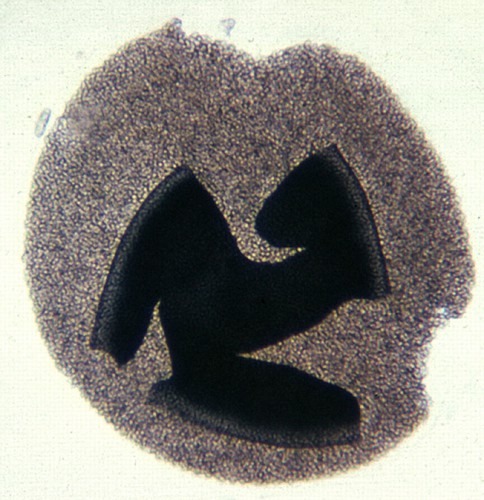 There is also a line of weakness where the cap – the spore package – joins the sporangiophore vesicle. In the end, the pressure causes the sporangiophore to explode which sends the package of spores far, far away – if the wind is in the right direction, as far as 12 feet. The goo from the sporangiophore goes with the spore package. It is very sticky, so wherever the spores land they tend to stay put. Ideally, that is on a blade of grass which is far enough from the manure pile to have a chance of getting eaten by a cow. This is very cool (though wait for more coolness below), but also has an economic and environmental impact. Pilobolus spores themselves do not cause harm to their mammalian hosts, but some parasitic worms have evolved a neat trick – hitchiking on the Pilobolus spores right into the digestive tracts of large mammals. 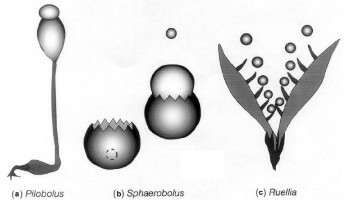 So, Pilobolus shoots its spores really far away, by exerting enormous pressure on the ‘cap’. But, anyone who’s been in an artillery unit in the military will tell you that the distance is determined by angle. Soldiers manning the cannons know that an approximately 45 degree angle of the cannon will result in the greatest distance for the projectile. But a cannon projectile is a large, heavy object (also smooth and aerodynamic), so air resistance plays almost no part in this calculation – the force of gravity is the only force that the projectile needs to overcome. A fungal spore is a microscopic object. At the small scale (pdf), physics works a little differently – gravity effects are minimal and the air resistance (drag) is the main determinant of maximal distance. Thus, 45 degrees is not neccessarily the optimal angle for achieving the greatest distance. Frances Trail and Iffa Gaffoor, working with Steven Vogel at Duke University, made some calculations (which I have not seen and I do not think they got published, but I heard them from Dr.Vogel some years ago), looking at the shape and size of spore-caps of several species of Pilobolus (they published data on some other shooting fungi, though – you can read the paper here if you have access, sorry – not OA). The optimal angle for maximal distance ranges, in different species, between 9 and 30 degrees, the most common fuzz found on cow dung requiring about 15 degrees. The maximal distance, without wind, is about 6-7 feet. Quite right. Six feet is about as close as cows will come to a cowpie in well managed cattle establishments. But does Pilobolus really shoot at 15 degrees? Well, what it does is it shoots towards the Sun. The way Pilobolus aims is through positive phototaxis. Like a sunflower, it follows the Sun in the sky and shoots at the Sun in the morning. So, the Pilobolus spores are found 6-12 feet away from the manure and they reproduce quite nicely even in the best managed cattle herds. So, they are probably shot at their optimal 15-degree angle. But they shoot at the Sun. Ergo, they shoot at the Sun when the Sun is about 15 degrees above the horizon. One can think of two possible ways this can be achieved. One would be a mechanical sensor that triggers the explosion when the angle between the stalk and the cap is 15 degrees. This would work only if each individual was always standing upright on a flat surface, which is not the case on the rough relief of a manure pile. The other strategy is to time the release so it coincides with the time when the Sun is about 15 degrees above the horizon. But, the trajectory of the Sun differs at different times of year. In the middle of the summer in a high latitude, when the daylength is, let’s say, 18 hours, the Sun shoots straight up from the East and reaches the zenith right above exactly at noon. Thus, the Sun is around 15 degrees above the horizon about 90 minutes after dawn. In winter, when the day may be only 6 hours long, the Sun traverses the sky low above the horizon from East to South to West, and may reach 15 degrees much slower (some Earth scientist in the audience can make a quick calculation here), e.g., 2 or even 3 hours after dawn. At the same time that Schmidle published his findings, Esther-Ruth Uebelmesser (1954) dedicated her thesis work to the same subject. Her thesis is remarkable in many ways. 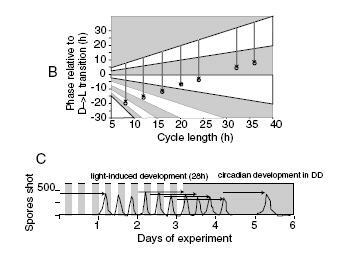 Many of her experiments anticipated circadian protocols, frequently used in later years (different T-cycles and photoperiods, reciprocity, night interruption experiments, entrainment by temperature cycles, etc.). Although she did not fully exploit the richness of her experimental approaches in her interpretations, she must be considered a pioneer of the field and has certainly inspired Colin Pittendrigh to use Pilobolus as a circadian model system (Bruce et al., 1960). Probably, Pittendrigh abandoned this model system because of the unbearable smell penetrating the laboratory when the bovine dung media was prepared (Michael Menaker and Gene Block, personal communication, December 2000). While in Neurospora accumulation of conidia (conidial bands) appears to be driven in these protocols with a constant phase angle in reference to lights-off (Fig. 2A), the phase angle of the spore-shooting rhythm in Pilobolus was systematically different with changing cycle lengths (Fig. 2B), possibly reflecting circadian entrainment. Closer investigation, however, revealed that the Pilobolus sporulation rhythm is also driven by the LD cycle, but unlike in Neurospora, by lights-on. Sporulation in Pilobolus is triggered by light, and the spores mature for approximately 28 h before they are shot (see arrows in Fig. 2B and C). The maturation time represents a kind of memory capacity for prior events. This is seen in experiments in which the fungi were released to DD (e.g., from LD 4:4 shown in Fig. 2C). The rhythm, synchronized to a given light cycle, persists for another 28 h until the endogenous circadian control takes over. 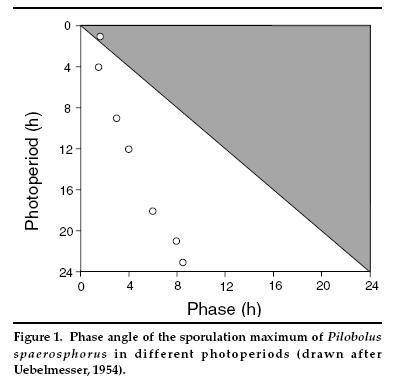 Thus, depending on conditions, the production of asexual spores in Pilobolus is controlled both by the clock (phase angle) and by light (a driven spore release once per LD cycle). What this all means is that a circadian clock in this fungus is entrained by the dawn (not dusk) and it integrates photoperiodic information in a manner that is consistent with the need to shoot spores towards the Sun at the time of the morning when the Sun first reaches 15 degrees (actually, the tracking movement of the spore lags the Sun by about 20 minutes – fungi are slow to move – but even that is probably compensated for by the circadian clock). Moreover, Pittendrigh’s students discovered that the Pilobolus clock is extremely sensitive to light (both intensity and duration of light). Its clock requires only a millisecond of light to be completely reset. This is where the story ends, for the time being. But there are still gaps. For instance, I am not sure if it was ever tested in the laboratory that Pilobolus actually shoots at 15 degrees. 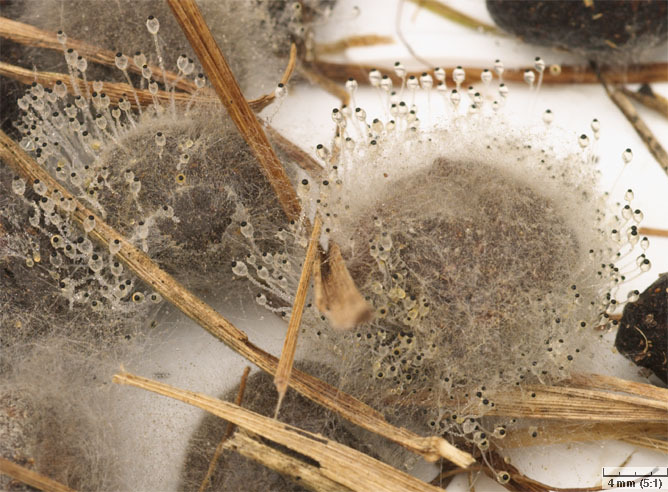 This is, according to Dr.Vogel, relatively easy to do, by placing the fungi on a manure-based medium at the center of one of those transparent semi-spheres used by exhibitors at various product fairs (e.g., technology fairs). 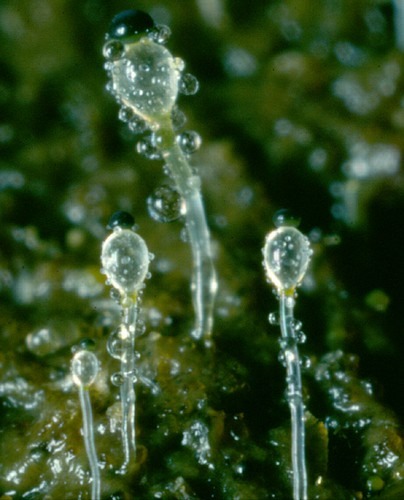 The ejected spores stick to the inside of the transparent plastic and can be seen from the outside. Measuring the length of the arc from the desk to the spore (and knowing the radius) is all one needs to calculate the angle. Second, we still do not know for sure if the Pilobolus cues in to the season-specific photoperiod (more likely) or the season-specific Sun trajectory (less likely). 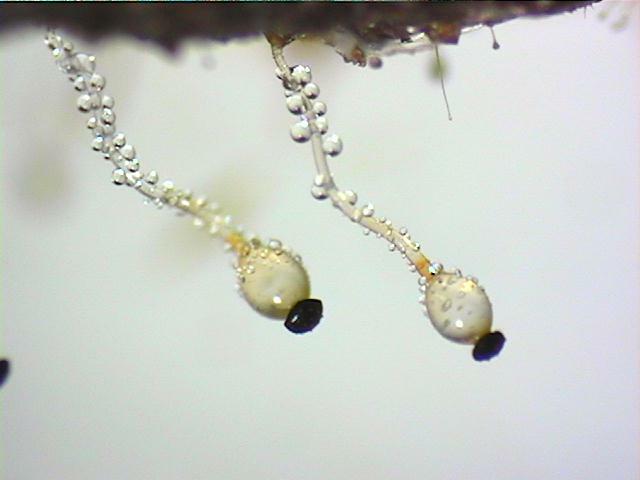 One can, in the laboratory, dissociate these two factors by exposing groups of fungi to summer-specific photoperiod and winter-specific trajectory (using a strong flashlight attached to a string and mounted on an arc-shaped wire, attached to a little motor) or vice-versa, as well as season-specific photoperiod with diffuse (instead of focused) light source. Finally, an evolutionary question. Horses are not as picky as cows concerning the distance from the manure at which they will graze. Pilobolus lives in our horses and shows up in the manure all the time. Is there relaxed selection for the populations (species?) that live in horses? Is their timing off? Is their angle-determination lousy? This would be an easy head-to-head test in the lab (and field) as well. And if there is such a difference between species, looking at molecules – dynamics of gene expression patterns and protein-protein interactions – can perhaps teach us something more about the ways simple parts can accomplish complex tasks in these organisms. But, if you’d rather learn all of the above in a Dr.Seuss-like poem, go ahead, it’s right here. Uebelmesser E-R (1954) Über den endogenen Tagesrhythmus der Sporangienbildung von Pilobolus. Arch Mikrobiol 20:1-33. This entry was posted in Chronobiology, Clock Classics, Clock News, History of Science, Physiology. Bookmark the permalink. It’s nice to learn about all of the scientific complexities of something as “simple” as shooting a spore. Nature is amazing!